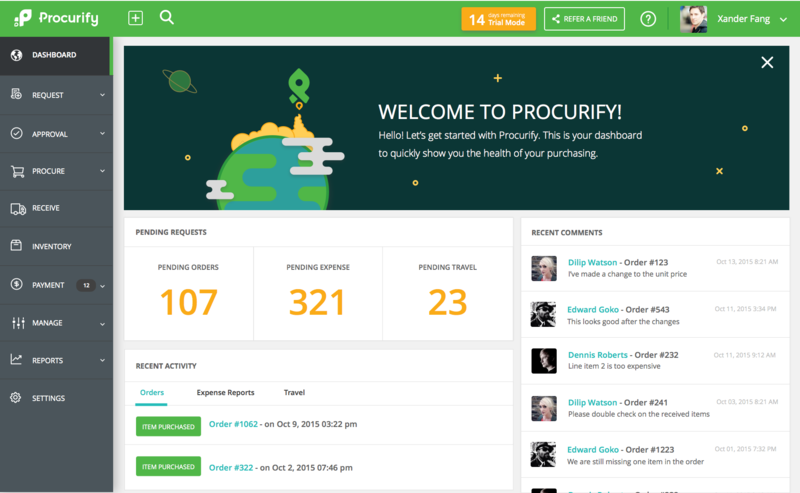 Procurify is a procurement and spending tool that works in any organization regardless of size. It ensures a smooth management process without any form of training; by utilizing a budget management kit for planning and organizing expenses, and making use of a reporting functionality that keeps track of every essential process. Since Procurify is cloud-hosted and constantly updated, users aren't forced to make upgrades or deal with frequent maintenance. The success of the tool comes down to inspiring business owners to leave behind their pursuit of third-party solutions and to only work on the current data they have. Procurify can help clear chaos within teams through two steps: clarifying the current data they have and offering them user controls that can help convert data to useful intelligence. The app manages data in a user-friendly manner. It boasts a requisition process that can help produce requests within a matter of seconds from any compatible smart device. Its own pre-approval workflows are centralized which ensure quick decision-making. Procurify's precision, speed, and budgeting abilities can be seen best during purchase order management. Users can authenticate and quickly approve deliveries, and keep track of their status to ensure realistic forecasting. It only takes a couple seconds for users to pair purchase orders with invoices and packing slips. At the same time, it gives users a bird's eye view of their current expenses. Procurify offers data access protection and prevents fraudulent and unauthorized user activities. Users with access rights can log in and make changes in their data through their mobile devices. Workflows are now defined and automated which means less time is spent on approval processes. This tool makes things easy to come up with approval process controls and thresholds for users, no matter which department or team they’re in, or where they’re currently located. Managers can view how every purchase can influence the budget of each team as well as managing user/team needs without undergoing lengthy financial records analysis. One big advantage of Procurify is that it prevents double billing. Information is archived in e-records and directly linked to alerts that ensure everyone is on the same page. The software makes it simple to extract comprehensive data insights, sift through purchase data history, and generate quality spend reports. The system lets users generate and disseminate purchase orders in a matter of seconds. Procurify houses records of all purchase orders in a single location, giving users access to extract and peek into data anytime. The software breaks down expenses within the company by the vendor, user, and department. It can also detect improper spending within the organization. Reimbursement requests always come with expense receipts. Persons submitting them won’t be forced to submit proof records. Company executives can just view the receipt and decide whether to approve or deny the request.